Central Oregon Nordic Club hikers trekked the trail from Smith Rock State Park to Grey Butte on Sunday, May 13. Two groups of hikers started at opposite ends of the trail, met partway and exchanged keys. Hiker Thom Iverson describes a “beautiful, sunny, clear, toasty” Mother’s Day hike. 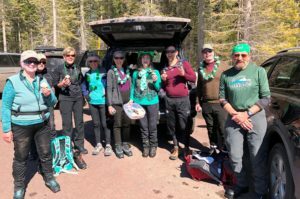 The distance was about nine miles one way, with about 2,000 feet of elevation gain for the uphill party, Thom reports.